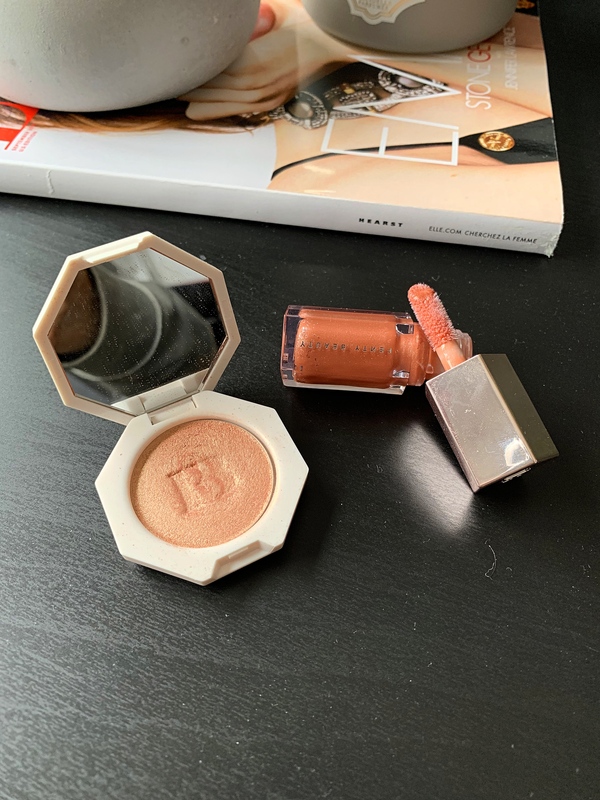 I am finally getting to try more Fenty Beauty products, this brand is so appealing, sometimes, I just want tot buy everything from them but at the same time, I never know what I want :p A real dilemma! Anyways, today, I am reviewing Fenty Beauty’s mini bomb gloss and Killawatt highlighter, this was a pure impulse purchase by the way, I just saw it at Sephora, near the cashier and decided to get it, I didn’t even see the price, I didn’t even think about whether I needed it. I just bought it. And to be honest, I don’t regret it! 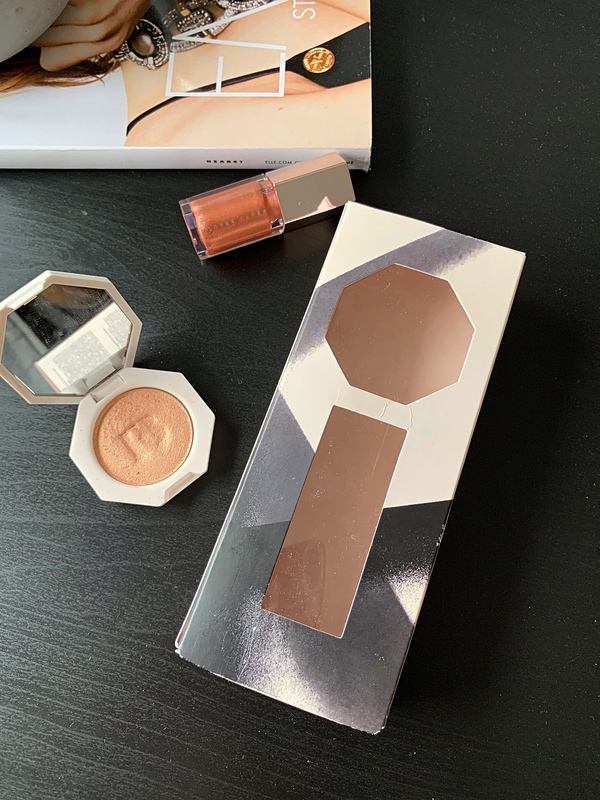 I actually mentioned these two products in my January Favorites ’19 so go check that out and don’t forget to check out my second youtube video, it’s a Get Ready With Me! Okay, this set contains one gloss bomb in the shade “Fenty Glow” as well as one highlighter in the shade “hustla baby”. The gloss contains 5.5ml of product while the highlighter contains 2.2g of product. I think you get an amazing amount for the price. This set is travel size so basically, travel-friendly, you can take it wherever you want. It retails for 28CAD or 23$. You can get it from Sephora or from Fenty Beauty’s official website. First of all, the two products come in a very pretty box, see through, so you can see what you are getting and all of the informations are written in the back of the box! The gloss bomb has also a very nice packaging, a nice shape, transparent tube but the opener is silver, brand’s name is silver as well. The packaging is very nice as well and I love the fact that it’s not in glass cause then it makes it perfect for traveling. This is truly the perfect set for traveling, you have a mirror, a gloss and highlighter, I love this! 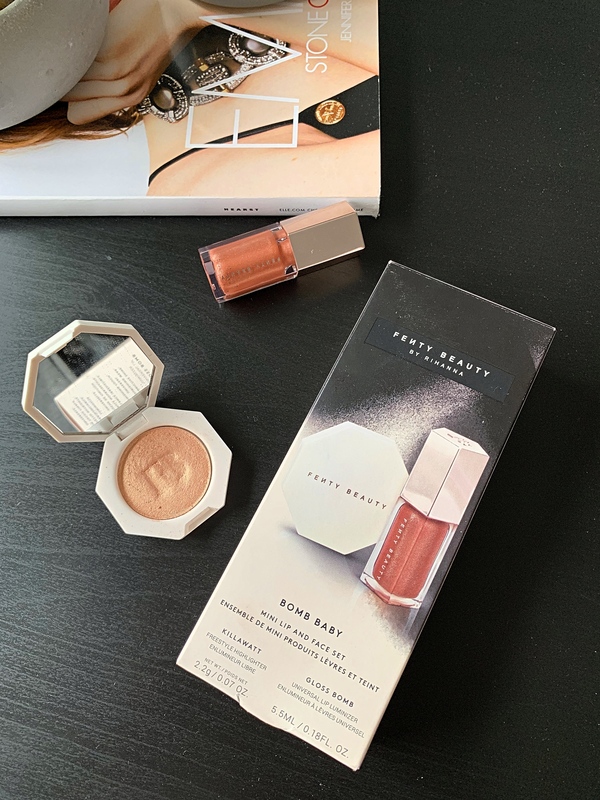 I am very satisfied with the formulas of these products, for the price, Fenty didn’t disappoint. 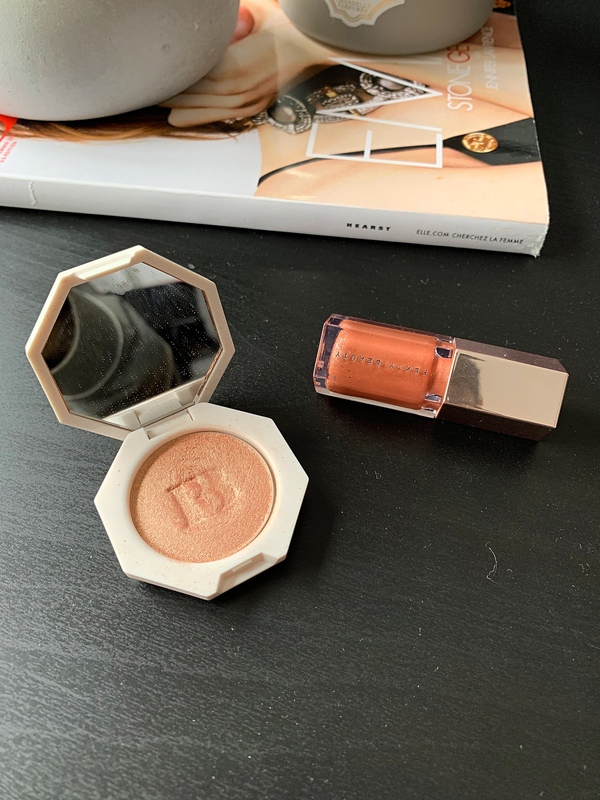 The highlighter is actually a powder but it is so buttery, it does not emphasize a lot the texture of your skin [all highlighters do but this one, not so much]. I think the shade is beautiful, it looks beautiful of my light, yellow undertone skin tone. I am not sure the shade will go for everyone. The sheen is gorgeous, it is blinding but looks super subtle and wet, I love it! 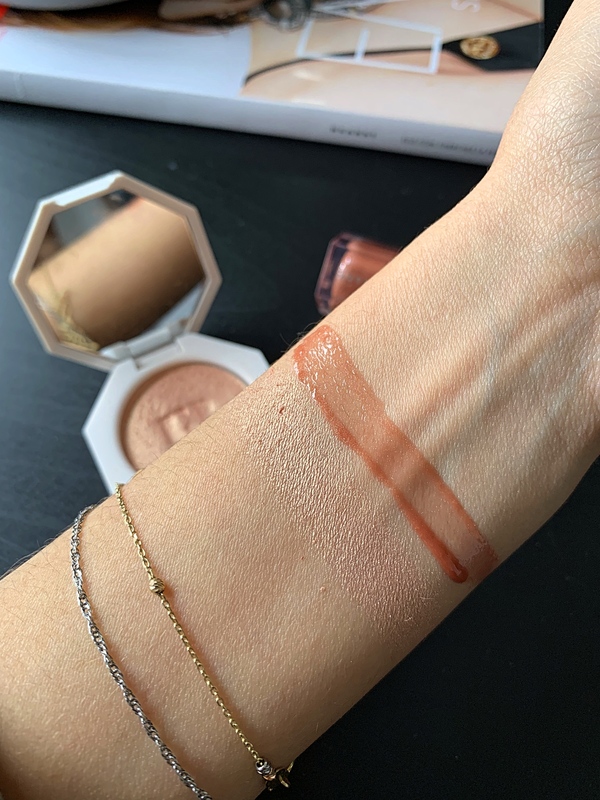 The gloss bomb is also amazing, I love the formula, it is very comfortable, very pigmented, it has a gorgeous glass finish and I do believe it can go with any skin tone! It is better than any gloss I have ever tried but again, I’ve never tried many lip glosses from high end brands. This is my first! For the highlighter, I would recommend to check out Wet N’ Wild’s Megaglo highlighters because the formula is very similar but like ten times cheaper!! yes hahaha exactly! it’s very smart of them 😛 Thank you so much!! I am tempted to try the fenty beauty foundation but I am afraid it will too matte and drying, what do you think? Awesome review, and these shades are so pretty! Fenty is one of my favorite brands. thank you very much!! I think fenty beauty is amazing! These shades are so beautiful. We go for vegan products due to allergies and so appreciate you pointing out the point. Are there some products you rec that are vegan? I am not sure really! I think they would have mentioned it on the website but they didn’t. Oooooh! I love a good dupe! Fenty is killing it. I love the shades and the packaging. I love the Fenty foundation, I’ve been curious about the rest of the products. Thanks for sharing! These products sound great! I love that you shared some dupes as well.